In Oregon, even sissies can survive! The sissy factor comes from the rough life of the Colorado Rockies. It is not like anyone talks about it. It is assumed. You won’t survive if you are a sissy. It comes with your Colorado Birth Certificate. In Oregon sissies can survive and thrive. I have had to face down my sissy monster several times. Garage door openers are sissy. What! You can’t get out of your car and open your own garage door? One day, I came to see the difference between unloading groceries in a foot of snow or in an Oregon downpour. I called Sears and within two days was pushing the button. How could I have been so foolish? Certainly there were no umbrellas in my family. 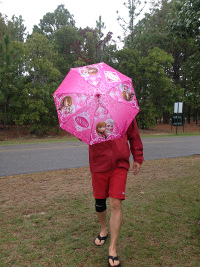 “We (non-sissies) don’t need no stinkin’ umbrellas,” was the response when I longed to have my own umbrella. In truth, I probably would never have used it in public. In Colorado it generally only rains for about 20 minutes every afternoon in the summer. People do not go out in the rain. Rather, they stand in doorways waiting for the ‘storm’ to pass. I would stand in doorways of western Oregon. No one joined me. When I did begin venturing out in the rain, I did not use an umbrella nor did I wear anything that might resemble sissy rain gear. I was in Oregon for 25 years before I bought a purple goretex coat with a hood and a beautiful umbrella. Several years ago, we planned to hike to the top of Mt. McLoughlin in southern Oregon. My hiking partner uses hiking poles. She is many years older than me, so I calmed the sissy monster by allowing that she was old. As our trek neared, she suggested I get hiking poles. I politely declined. She brought me a pair of ski poles she had cut off for me to use. They were not only sissy, but dorky. She dragged me to Peak Sports where I begrudgingly invested $100 in classy, titanium sissy sticks. We unloaded our gear at the trail head. I cautiously looked around to see if anyone would see me pull my embarassing sticks out of the car. We headed out. Within ten minutes, I understood. My hands were not swelling. There was a new confidence in my pace, and when I stumbled, there were three appendages on the ground to stabilize me. I was a convert. I suppose because it took me so long to learn my lessons, I have a sincere fondness for my garage door opener, my beautiful umbrella, and my sturdy hiking poles. I have become a sissy, and am proud of it!